Goldman analysts see a 28% downside for GM stock over the next 12 months. General Motors Co. (GM - Get Report) is running out of gas. Shares of the Detroit-based automaker was down 3.32% to $43.16 early Monday afternoon after Goldman Sachs analysts slashed their rating for the stock to "sell" from "neutral" and assigned a $32 price target. Based on GM's closing price of $44.64 Friday, that implies a 28.3% downside for shares. Analysts led by David Tamberrino predict a "downward inflection in GM earnings," Goldman wrote in a note Monday. "Our work on pickup trucks and crossovers suggest that GM likely experiences volume and mix headwinds that exacerbate the cyclical profit headwinds," Goldman wrote. "Combined, we see this driving 2018E EBIT-adjusted down by 22% [year over year] and compressing overall corporate margins." Tamberrino added that Goldman believes the North America auto cycle has peaked and is set to normalize in the coming years. The bank is cautious on the auto sector as a whole. As for GM specifically, production cuts are expected to continue as a result of decreasing consumer demand for new vehicles. GM is refreshing its pickup truck line in 2018. That could leave the company "vulnerable to share loss," Goldman added. "Historically, pickup truck refreshes drive market share losses of 100 bps to 300 bps in the year during the launch," Goldman wrote. This year's GM refresh is made especially dangerous by Ford Motor Co.'s (F - Get Report) recent F-series model refresh that has left Goldman to "expect share shifts to pressure GM." 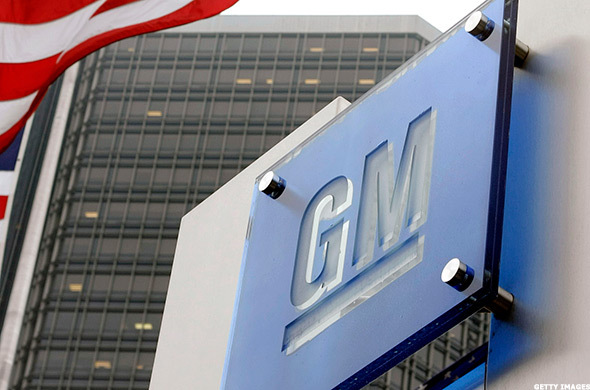 The GM downgrade comes less than a week after noted auto analyst Adam Jonas of Morgan Stanley reduced his rating for the company's shares to "hold" after noting the stock "ran too far too fast." GM stock has risen 28% since the start of the year on European divestitures and high hopes for the company's foray into autonomous driving.